Events/News | Darcy Maulsby & Co. Whether you’re looking for a unique perspective from an author, writer, marketer, farmer, foodie or photographer, Darcy can help. Contact her at darcy@darcymaulsby.com to start the conversation. You can also connect with her on Facebook and on Twitter. In the meantime, here’s what’s new at Darcy Maulsby & Co.
Friday, March 2, 2018, 9:00 a.m. to 3:00 p.m.
Saturday, March 10, 2018, 7:30 p.m.
Monday, April 9, 2018, 1:15 p.m.
Thursday, April 12, 2018, 5:30 p.m.
Sunday, April 15, 2018, 2 p.m.
Tuesday, April 17, 2018, 7 p.m.
Wednesday, April 18, 2018, 11:30 a.m.
Thursday, May 17, 2018, 6:30 p.m.
Wednesday, June 13, 2018, 7 p.m.
Tuesday, September 18, 2018, 6:30 p.m.
"Dallas County Rebels: How a Posse, a President and the KKK Changed American History"
19th annual Country School Preservation Conference: "A Vanishing Heritage"
Mondday, Oct. 29, 2018, 6:30 p.m.
Saturday, Feb. 10, 2018, 2 p.m.
Friday, Feb. 16, 2018, 7 p.m.
Tuesday, Jan. 2, 2018, 9: 30 a.m.
Tuesday, Jan. 2, 2018, 6:30 p.m.
Saturday, Jan. 13, 2018, 5 p.m.
Unbeatable Baking, Iowa Style. There's nothing more comforting than the tempting aroma of homemade bread, pies and other yummy baked goods filling your kitchen, right? Join blue-ribbon baker, food writer, farm cook and Iowa author Darcy Dougherty Maulsby to explore the art of Midwestern baking. You'll not only enjoy plenty of hands-on learning as you bake versatile yeast rolls, fool-proof pie crust, classic Dutch apple pie and scrumptious cake, but you'll take home treasured recipes that will become staples in your home for years to come! Sunday, November 5, 1:30 p.m.
Wed., November 8, 6:30 p.m.
Satuday, November 11: 9 a.m. to 4 p.m.
Monday, November 20, 6:30 p.m.
Tuesday, November 28, 10 a.m.
Tuesday, November 28, 6:30 p.m.
* This event features my Culinary History of Iowa book--more details to come! Sunday, Oct. 29, 1:30 p.m.
Monday, Sept. 11, 7 p.m.
Dallas County book launch party, program and book signing, Hotel Pattee, Perry, Iowa. I would like to personally invite you to Perry to the historic Hotel Pattee at 7 p.m. for the debut of Dallas County, my latest non-fiction Iowa history book. It’s all here—drama, crime, romance, tragedy, mystery, action, adventure, sports, food, agriculture, architecture, science, business, biography, comics and more—all told through more than 100 vintage photos and short stories. Check out the full story here! Tuesday, Sept. 12, 6:30 p.m.
Thursday, Sept. 21, 6:30 p.m.
Sunday, Sept. 24, 2 p.m.
Thursday, June 15, Williamsburg, Iowa, Public Library, Enjoy "Adventures in Iowa's Culinary History" during this free program and book signing, which starts at 6:30 p.m.
Wednesday, May 10, Marcus, Iowa, Public Library, Enjoy "Adventures in Iowa's Culinary History" during this free program and book signing, which starts at 6:30 p.m.
Monday, May 22, West Des Moines, Iowa. Artisan Gallery 218 in Historic Valley Junction, Enjoy "Adventures in Iowa's Culinary History" during this fun program and book signing, which starts at 6:30 p.m.
Tuesday, April 11, 2017, Wall Lake, Iowa, Public Library. Enjoy "Adventures in Iowa's Culinary History" during this free program and book signing, which starts at 6:30 p.m.
Wednesday, March 22, 2017, Cedar Rapids, Iowa. National Czech and Slovak Museum and Library, 5:30 p.m. "History + Happy Hour: Savor Iowa's Rich Culinary Heritage" book program and signing. Refreshments available! Tuesday, March 28, Clarence, Iowa, Public Library. Enjoy "Adventures in Iowa's Culinary History" during this free program and book signing, which starts at 7 p.m.
Sunday, Sept. 11, 2016, Lake City, Iowa. Historic Central School, 2 p.m. "A Culinary History of Iowa" book program and signing. Free refreshments provided! Wednesday, Sept. 14, 2016. Tune in to "Talk of Iowa" on Iowa Public Radio for an interview about my new book "A Culinary History of Iowa" from 10:40 a.m. to 11 a.m.
Friday, Sept. 16, 2016, Fort Dodge, Iowa. Tune in to the KWMT Power Lunch with Duane Murley on 540 AM for an interview about "A Culinary History of Iowa" at 12:40 p.m.
Monday, Sept. 19, 2016, Des Moines, Iowa. Tune in to The Big Show on WHO News Radio 1040 AM for an interview about "A Culinary History of Iowa" from 11:30 a.m. to 1 p.m.
Saturday, Sept. 24, 2016, Villisca, Iowa. Forgotten Iowa History Day. At 11:35 a.m. I'll be providing a "Culinary History of Iowa'" program and book signing. Sign up here for this free day filled with great speakers, tours, and all things Iowa history! Sunday, Sept. 25, 2016, Colo, Iowa. At 2 p.m. stop by the fabulous Niland's Cafe along historic Highway 30 in Story County for a free program and book signing featuring "A Culinary History of Iowa." Free refreshments provided! Listen to stories from "Culinary History of Iowa: Sweet Corn, Pork Tenderloins, Maid-Rites and More"
Listen to Darcy's "Insight on Business" interview about preserving historic photos as she visits with host Michael Libbie in Des Moines. Darcy was recently featured on "Market to Market" on Iowa Public Television in the segment "Agri-Tourism in the Shadow of a Lawsuit." 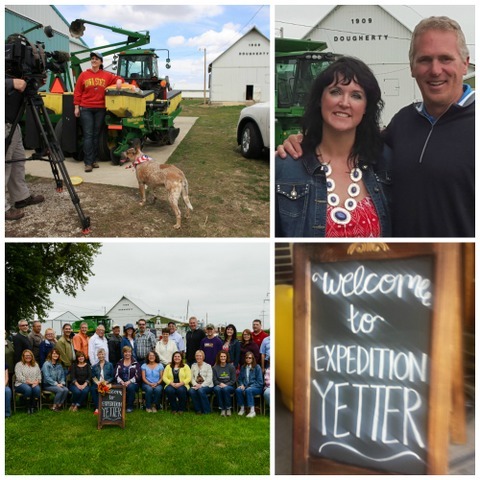 Click here to watch the clip, which was filmed at her family's Dougherty Century Farm in Calhoun County and along the route of Expedition Yetter, which was designed to connect small-town and urban residents with the Iowa farms and agribusinesses where their food comes from. 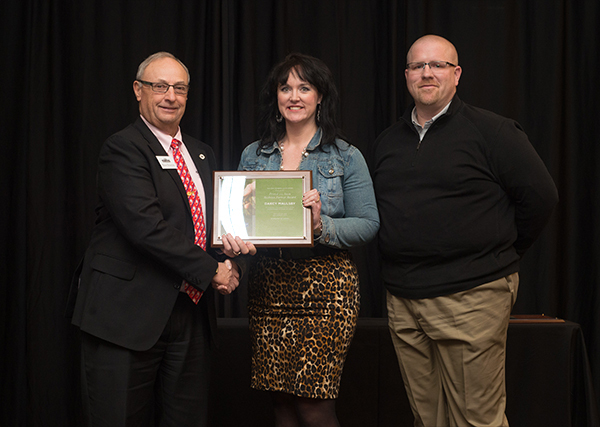 The Iowa Soybean Association (ISA) has honored Darcy Maulsby of Lake City with the prestigious “Friend of the Iowa Soybean Farmer” Award in recognition of her support of Iowa soybean farmers through her actions and efforts. Maulsby received the award in Des Moines on Jan. 26 during the ISA’s 2016 awards banquet. Known affectionately as “Yetter Girl,” Maulsby is a Calhoun County native whose agricultural roots inspired a passion for sharing information about where food comes from and the value of family and dedication that consumers and farm families share. Maulsby graduated from Iowa State University with degrees in journalism/mass communications and history, followed by a master’s of business administration degree. She went on to become a frequent and respected contributor to many local, state, national and international ag publications and has worked closely with a variety of agricultural organizations, including the Iowa Farm Bureau, Coalition to Support Iowa’s Farmers and the National Pork Board through her marketing and communications company, Darcy Maulsby & Co.
Maulsby continually reports on agricultural issues while advocating for Iowa’s farmers and rural communities. Recently, Maulsby added “author” to her list of accolades, as she completed and published “Calhoun County,” a historical look at small-Iowa and rural Iowa through the eyes of those who lived it. A second book, “A Culinary History of Iowa,” will provide a taste of uniquely Iowa foods and traditions and will debut in the summer of 2016. Maulsby’s motivation for sharing stories of rural Iowa life is much more than a job, it’s a passion. This was especially apparent as she hosted the Iowa Food & Family Project’s “Expedition Yetter,” a day-long excursion in August 2015 of farm tours, capped with a dinner on her family’s Century Farm. Maulsby is a true friend to Iowa’s soybean farmers and Iowa agriculture. You can connect with her at www.darcymaulsby.com. Unlock the Secret History of Rural Iowa. Think rural Iowa is just quiet little towns and farms? Think again. Calhoun County’s rich history includes entrepreneurs, entertainers, gangsters, bootleggers, sports stars and world-famous authors and more. 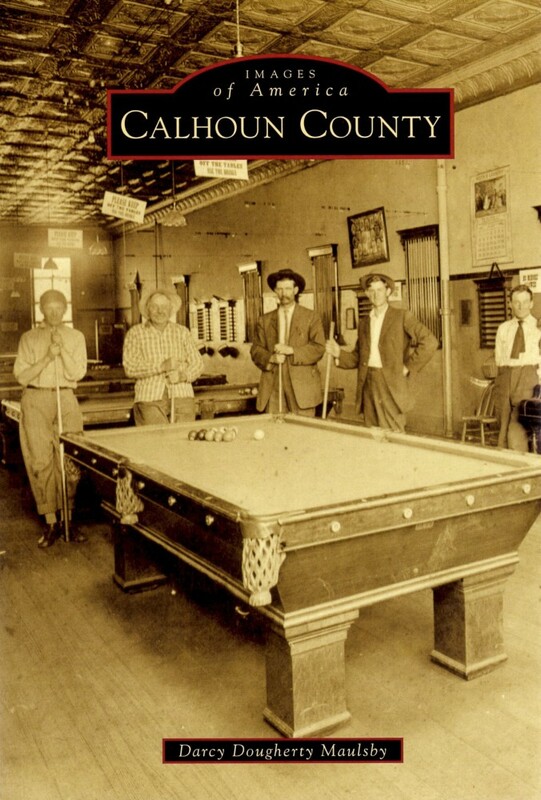 Darcy Dougherty Maulsby, a Calhoun County native and Lake City author, brings this history to life in her new book “Calhoun County,” published by Arcadia Publishing. Click here to read more.